Dinner: Shawarma pizza after a delightful swim. Both sides of the family came out to the pool yesterday. Was the temperature about 100 degrees? I think so! Cindy and Tara brought 4 kids. Marsha and Todd brought three teenagers. The backyard was a happy oasis. 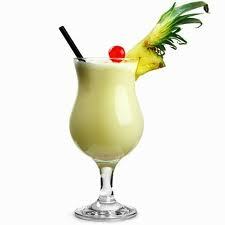 The adults were drinking high-carb pina coladas. Boy, those drinks DID look good! Marsha brought tortilla chips and black bean dip. The dip was only 2 grams of carbs per 2 tbsps. I abstained from the drinks, but laid back in my pool float drinking my 2.6 carb Ultra beer. I planned to try the dip, but I never got out of the pool! Low point: I did eat the crust on my pizza, again. I think I may be able to blame this on the steroids I’ve been taking since Tuesday. I’m just a bit hungrier than usual. Dessert was 2 squares of melted 70 percent chocolate with peanut butter and a big glass of water. Breakfast was yogurt, lunch was 2 beddar cheddars. Tuesday morning’s usual schedule – I went to work and ate a low carb yogurt. I was debating what to do about this 6-inch diameter bug bite that developed on my forearm over the weekend. It just wasn’t getting any smaller. Rick was at a client meeting. Palmerworks has another monthly newsletter job. Rick enjoys creating those as much or more than he does making websites, so I was happy for him. I texted and asked him to pop by and get me around lunchtime and take me to a local urgent care place in Garden City. I ate some almonds to tide me over. He arrived around 1:30, and I decided to get lunch first. I know that skipping meals always makes me more tempted to eat something risky. 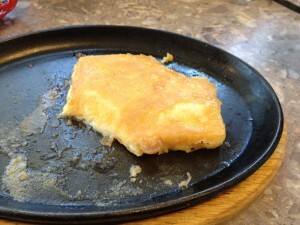 We went to GJ’s Diner, and I had an urge for something different, so I ordered a flaming cheese saganaki appetizer. OPA! Rick ate half. Depending on what website you read, a whole order is from 3.9 to 20 or 30 grams. 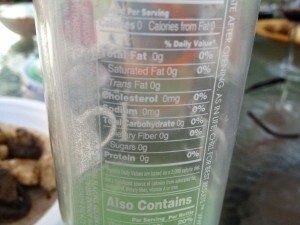 Livestrong.com says 3.9 with 1.7 grams of fiber. I like that one! This didn’t appear breaded in any way, so I think my portion was under 5 grams. I also had one coney dog sans bun. Off to the medical place. Turns out I probably don’t have Lyme Disease. I got some antibiotics and steroids to take for a week. It was a nice, quick, well-run place. I have a sort of “doctor phobia,” and NEVER go. I could be on my death bed and still try to make tea tree oil cure me in some way (it didn’t work on the swelling bite; then again, maybe I didn’t give it enough time!). Anyway, the nurse and I were talking about low carb diets, which many of the staff had just started. I told her about pasta, rice, and potato substitutes and they were reading my blog when I left. Odd feeling knowing that someone actually reads this rambling journey. Dinner: I had to work until 6:30 to make up the hours at lunch/doctor. We don’t have sick time at my place of employment, and I really didn’t want to dip into my vacation time. I arrived home at 7 to find 4 young children in my pool (2 grandkid plus friends). Before swimming, I sat on the deck with Rick and Cindy and had a nice relaxing low carb drink. Rick found these at Kroger and they have ZERO carbs! 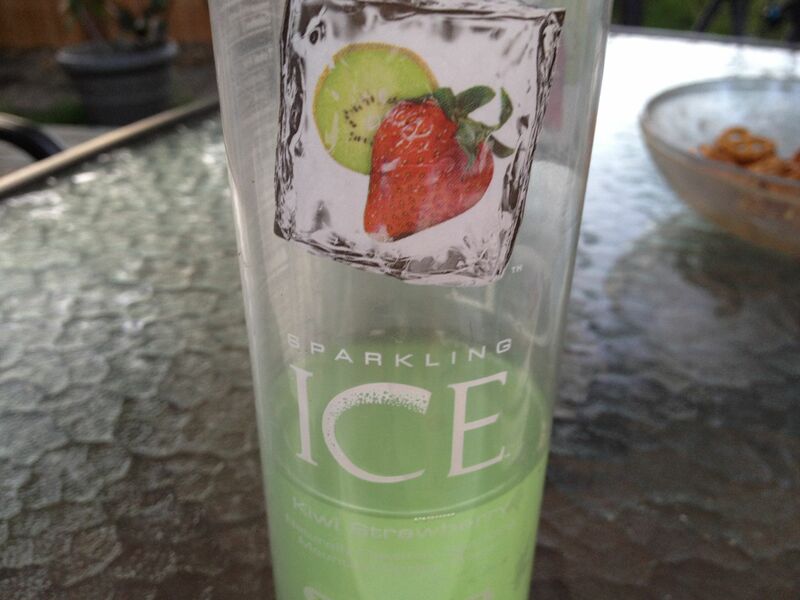 It’s called Sparkling Ice. I love the lemon/lime flavor. It’s good with a splash of vodka, too! After swimming, the kids went home and I warmed up the chicken kabobs left over from Sunday. I followed it with 2 square of 70% chocolate. Oh, as to the title of this blog? Whenever I had a bad day, in terms of things like having to go to the doctor, or any other activity I really dislike, I would always reward myself. The reward was usually something like a chocolate milkshake after a dental visit, or buying a bag of peanut butter M&M’s after a doctor appointment. As I was waiting for my prescriptions in CVS, I remembered that. I started to head towards the candy aisle. Suddenly, I took stock of how good it felt to be wearing a smaller size, and the hopefulness I feel when I think that 31 pounds off since mid-January could mean 60+ pounds off by Christmas. The 70% chocolate squares I eat are enough to satisfy me, so why play around with more carbs? I’m really proud that I can think through most of these old temptations. I think I can do this! I had low carb yogurt for breakfast and some almonds for a morning snack. Rick needed some things at Lowe’s, so he dropped by to pick me up. I bought the supplies we needed for the electrician to finish the jobs at the house we’re fixing up and selling. After Lowe’s, we started to go to Culver’s, but it was pretty packed. Instead, we decided to try Ryan’s buffet. I always think I should be able to find lots of low carb options, but it was a pretty disappointing lunch. I had salad, of course, and selected anything I could see that looked like a good possibility: taco meat topped with cheese, a couple of tablespoons of chicken in teriyaki sauce, some broccoli. I also decided to try collard greens. Nope! I did really well, but it wasn’t all that enjoyable and there were not many options. Not a wise expense. At Albert’s for trivia and late dinner, I ordered the usual chicken club salad with blue cheese dressing. 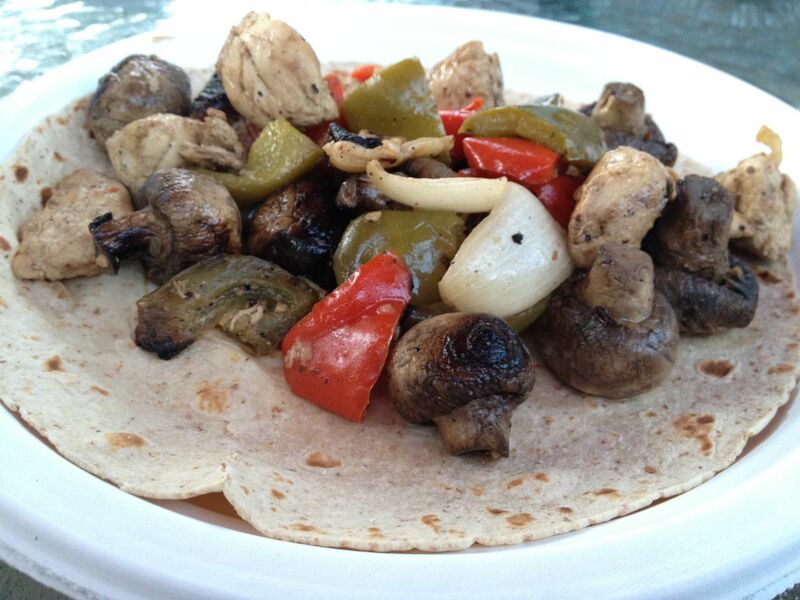 It is mighty filling, packed with grilled chicken slices, and muy delicioso! When I arrived home at 9:30ish, Rick was sitting by a bon fire. I decided to have a glass of cabernet with him. We didn’t go inside for an hour, and then watched the season opener of HBO’s new Aaron Sorkin series: the Newsroom. I ate 2 squares of 70% cocoa topped with natural peanut butter. I don’t know if I would even like a real peanut butter cup anymore. These are delish. Day 165: Wow! A huge weight loss! Today’s weight loss: 5 1/2 POUNDS! Wow. Getting back on track works like a charm! I stayed under on my carbs ALMOST every meal. I said “no” to a lot that I was tempted to eat, and I got a few laps in the pool. I knew my clothes were getting looser, so maybe some of last week’s weigh in debacle was water weight or something. Lunch was a nice outing on a sunny day. We headed to a new coney place and I ordered two coney dogs with no bun. All totaled, the bill only came to $8 with Rick having a coney, fries, and soup. We’ll be back! I wanted to swim before dinner, but I was pretty hungry. We decided to skip paying $40 to $50 at US12, where we often celebrate the end of the work week. I usually get 3-4 drinks, Rick gets 3-4 beers, and we have steak bites, plus whatever Rick orders. I really like sitting out in the sun and watching the traffic go by, and I especially like not being at home where I can see all the things I haven’t done. LOL. It’s a plus that someone waits on us, too. HOWEVER, we went to the grocery store and picked up some low carb snack items, and I knew I had some zero carb bread at home. Oh, and I also found some 2.6 carb beer. I’m not a huge beer drinker, but summer brings out a little craving for a beer once in a while. 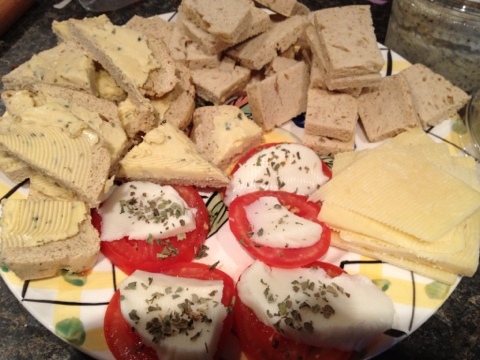 Once home, I jumped into my bathing suit and quickly assembled a low carb appetizer platter. I cut several pieces of the disappointing, tasteless bread into small squares and topped them with sliced tomato, and mozarella cheese. I drizzled the plate with balsamic vinegar. Then I put the rest of the squares into a bowl with 2 side dipping dishes: avocado spinach dip and spinach hummus. I grabbed a low carb beer and headed out to join Rick on the deck. It was very very nice (and MUCH cheaper!). The added bonus was jumping into the pool when we were done eating the appies. The grandkids came by for a swim. After they left, I was tired and hungry. I heated up a cup of taco meat, topped it with cheese, sour cream, onions and jalapenos. YUM. Dessert was 2 squares of 70% chocolate and peanut butter. Lunch: I took the last piece of shawarma pizza to reheat for lunch. Somehow 3 other pieces disappeared from the fridge. Rick had a craving. Brandon had some leftover chorizo and eggs which he donated to the cause. They were pretty good. I used to have chorizo and eggs in a tortilla for a delicious breakfast at my old friend Joan’s. I haven’t had that in 20 years. I think I’ll have to make some this weekend. Rick actually bought me some chorizo a while back and it’s in the freezer. Trivia was at Max and Erma’s last night. If you recall, last week’s trivia at Applebees was a no-carb travesty. I had a margarita and tortilla chips. This was followed by last Sunday’s 4 pound weight gain. SOOOO, I planned ahead and found that there is such an item as a “burger stack” on their low carb menu! Unfortunately, the waiter knew nothing about this option nor this menu, so I had to navigate the regular menu. I chose a burger with buffalo mayo celery slaw on it (sans bun). I substituted broccoli for my fries. I was pretty damned proud of myself. It was just as good, if not better, than last week’s dinner. I eat dinner out alot and I’m always happy when I can find something low carb and satisfying. Yesterday was another “on-track” day. I think that huge weight loss scared me into keto-compliance. It has been quite a few months since I started this plan, and I really hate going backwards and seeing negative progress (now there’s an oxymoron!). It just seems like I’m wasting my time when I KNOW the plan works, and I dabble in carbs. I’m also trying to balance that attitude with the one that reminds me that this is a journey, that I’m going to be doing this for a long time until I reach my goal, so I should lighten up and get some balance about it. Anyway, breakfast at work was yogurt. For lunch, I made 2 beddar cheddars. For dinner, I thought I’d make something Mexican. That’s my very favorite food, so why not do it in a no-carb fashion and enjoy it as much as I can. I cooked up some taco meat, topped it with cheese, onions, sour cream, and jalapenos, and enjoyed it very much. Rick made low-carb chocolate mousse for dessert.